Used Inkjet Cartridges turned into Artwork | TonerGreen - Eco-Friendly Toners from the U.S.
You may have already heard about the Epson inkjet cartridges that were turned into lamps a few months ago. 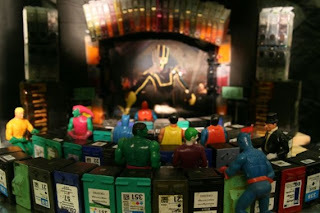 Well, the innovative ways of recycling printer inks did not end there because Faith Pearson has just turned used inkjet cartridges into science-fiction dioramas as a part of her art projects. The famous models that she has created are those seen in Godzilla, King Kong, and many more. Although it was not easy to use printer cartridges as building blocks for her works, it was definitely worth the time and effort because of how the models appeared when these were displayed. You can also recycle printer cartridges by donating these to recycling programs if you cannot think of other ways to reuse your empty containers. You will even be paid by some stores for a specific cartridge if you decide to turn this over, so why not try it now?